I have always been a fan of Teenage Mutant Ninja Turtles ever since I was a kid. I was hooked with the old cartoons as well as with the three movies when it got really popular with us 90's kids back in the day. I remember owning almost all the core action figures as well as the most iconic vehicles from the cartoons. Too bad I don't have them anymore. I got really hyped when I found out Nickelodeon will be making a new TMNT series for the younger generation. I was even more ecstatic when I found out Lego will be releasing toy sets based on the new series. 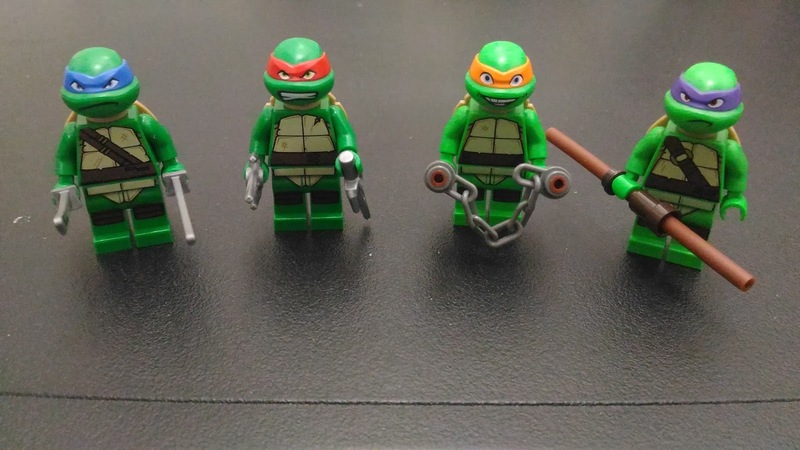 As an AFOL, I knew I just had to get my hands on the minifig counterparts of our heroes in a half shell. After a couple of years, I finally have all four and a couple of bonus figs as well. Let me first show you my current TMNT collection from the latest line. I just had to get my hands on these when they came out in the local toy stores. 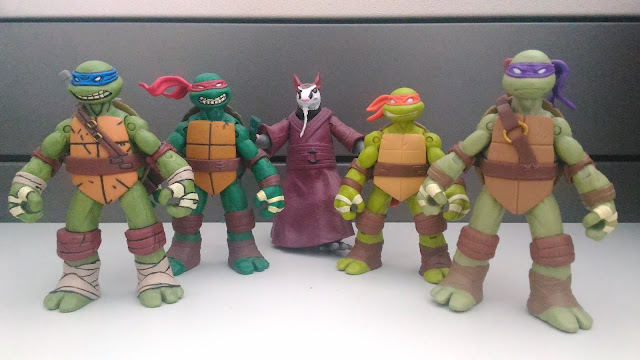 I have the basic figures of Leonardo, Raphael, Michelangelo, Donatello and Splinter which were released back in 2012. The Splinter figure was a gift from my buddies at work. These guys guard my workstation at the office. I really love these action figures since they're well-articulated. You can pose them whichever way you want. II also got the classic collection figures of the Turtles. Unlike the basic figures, I still haven't opened these guys. 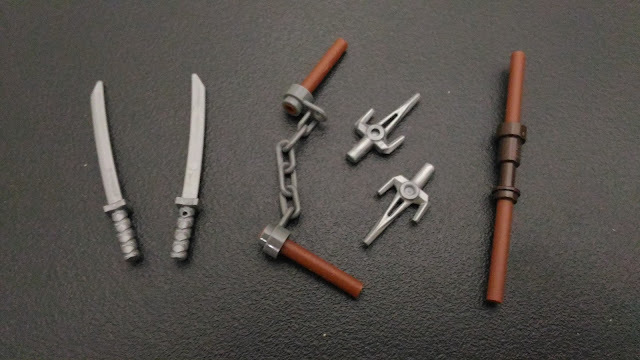 I keep these in my toy chest with no plans of opening them soon. These figs are a lot taller than the basic figures. They also capture the look of the Turtles from the original cartoon. Compared to the original toy line, these guys look better. They're more poseable and they also come with a display stand. I also have these finger puppets from my sister who lives in Atlanta. My wife loves them! She thinks they're really cute. Tubby Turtles, man! 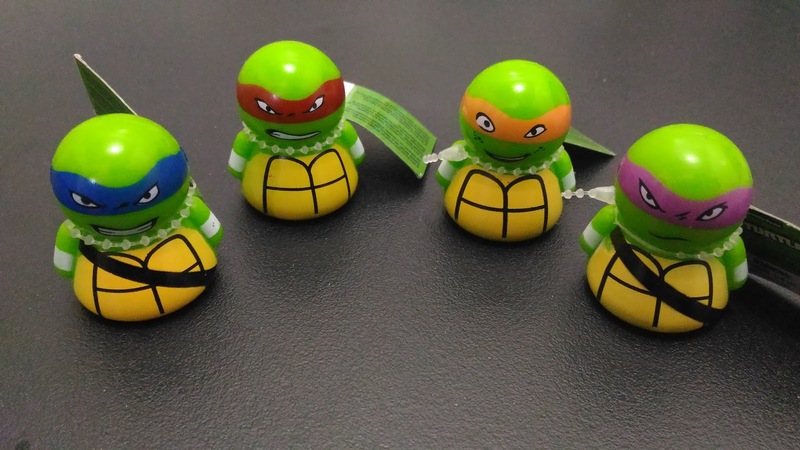 Now, let's look at the minifigs of Leo, Raph, Mikey and Donnie. It took me a while to get all of them since I found the TMNT Lego sets a bit expensive and I wasn't really into collecting all the sets because I just wanted the figs. 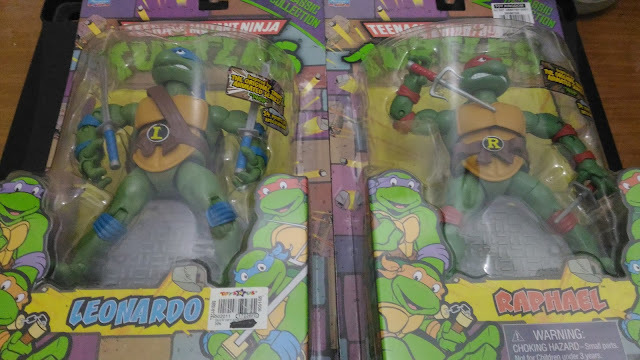 My sisters got me the Turtle Lair Attack set (Set # 79103) which had Leo and Raph. To obtain Mikey, I had to buy the Kraang Lab Escape set (Set # 79100). Finally, I bought the Shredder's Dragon Bike set (Set # 79101) to get Donnie. By the way, I did a review of Shredder's Dragon Bike on the blog recently. Check it out! 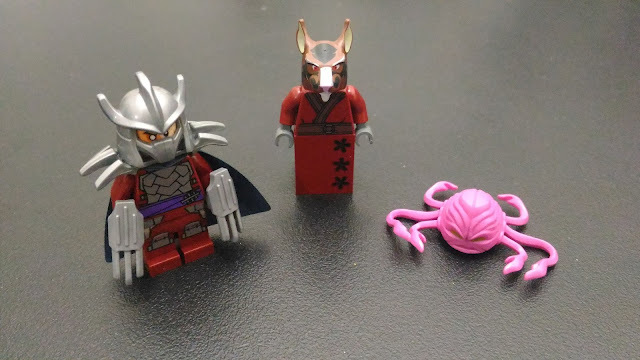 Apart from the Turtles, I also have Splinter, Shredder and Kraang figs. I also have a Purple Dragon fig as well as three (3) Foot Soldiers but I chopped the former and traded the latter for projects for the blog. There you have it, folks! My humble TMNT collection! I'm not really into collecting all the figs from a line. 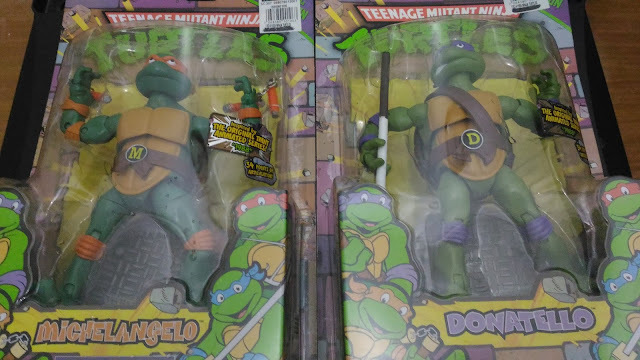 I'm already cool with just having the figs of Leo, Raph, Mikey and Donnie. The rest are just bonuses actually. It took me quite a while to complete the minifigs of the Turtles but I'm really happy now that the task is finally done. Maybe I should start collecting Ghostbusters figs now? Thanks for reading another entry here at Nothing But Brick! Stay tuned for more posts this month. I'll be featuring August's Builder of the Month (BOM) soon. I'll also be posting an entry on several projects I've decided to put on hold indefinitely because of a recent change in heart due to a certain theme (Imperial March starts playing in the background...) that I've been avoiding for some time but finally gave in to. Last but not the least, there will still be set reviews of kits that I've been keeping in my brick chest. That's it! Enjoy the rest of the week, folks! Till next entry! Truly decent post. I just discovered the blog and wished to say that I've really delighted in browsing the blog entries. Thanks for the awesome comment! Glad you like the blog. Unfortunately, I've been pretty busy with a lot of stuff lately which is why I haven't been able to post new entries. Hope to be able to catch up on my backlogs soon. Stay tuned!